Bumping up against December’s “order by” deadlines? Running low on funds? Or just tired of the mall scene? Find respite by using your grill and/or smoker to make homemade gifts for the important people on your list. In the process, you might even recapture some of that old-fashioned holiday spirit. Here are six worthy projects, most of which not only require very little hands-on time, but that travel well, too. So relax: We’ve got you covered. 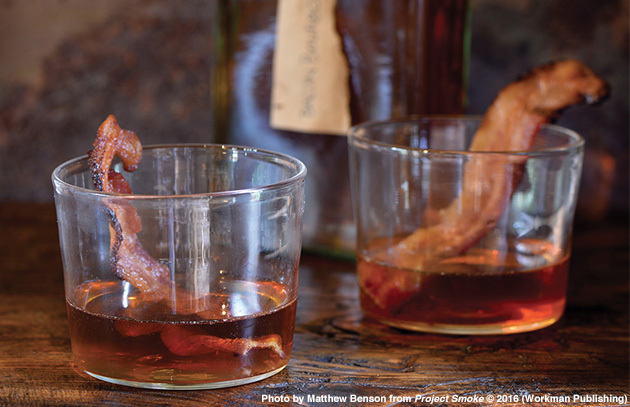 Bacon Bourbon: What happens when bourbon and bacon have a one-night stand? The best thing to happen to bourbon since the Manhattan. Mix warm smoked bacon fat with bourbon, freeze overnight, and strain into an attractive bottle. (For a complete recipe, click here.) Old Fashioneds, not to mention eggnogs, will never be the same. Sriracha Beef Jerky: The heat-seekers on your gift list will be looking to hide their stash and avoid sharing once they taste this terrific jerky, blasted with wood smoke and everyone’s favorite hot sauce. (It was a huge hit with my Project Smoke recipe testers.) It ships exceedingly well, too. For another jerky recipe and helpful tips, click here. Smoked Nuts: Vastly superior to the “smoke-flavored” nuts you buy that have likely never seen the inside of a smoker. Toss 2 cups of your favorite “raw” nuts (unroasted, unsalted) with 1 tablespoon of olive or vegetable oil. Stir in 1 tablespoon of sugar, 1 teaspoon each of sea salt, freshly ground black pepper, and smoked paprika, plus 1/2 teaspoon each of ground cinnamon and cumin. Tip into an aluminum foil pan or mesh grill basket and smoke at 250°F until toasted and browned, 40 to 60 minutes, stirring several times. Let cool for 2 hours before packaging. Customize using your own favorite barbecue rub. Smoked Salt: Excellent smoked salt is widely available these days, but you had to smoke your own when I first starting writing about barbecue. Because it takes several hours to imbue salt with true smoke flavor, I like to piggyback it on long cooks, the kind required for brisket or pork shoulder. To make it, simply spread coarse salt (kosher or sea) in an aluminum pan to a depth of about 1/8 inch. Place it on the grill grate and smoke at 225 to 250°F for about 6 hours, stirring every 30 minutes. Let cool. You can add flavor by mixing it with dried herbs (rosemary is especially good) or other spices. South Carolina Mustard Sauce: Not all barbecue sauces are red. One of the most famous regional barbecue sauces in America is a mustard-based sauce from central South Carolina. Many of the area’s earliest European settlers were from Germany, and they brought one of their favorite flavor combinations—pork and mustard—with them. Personally, I like to smoke the mustard—preferably Dijon—before mixing up the sauce. (A handheld smoker like the Smoking Gun works well, or you can use a conventional smoker.) For other homemade sauce ideas, see my book Barbecue Bible! Sauces, Rubs, and Marinades. Also check out our Holiday Gift Guide for Foodies and our Holiday Gift Guide for Grillers and Barbecuers.